The next Brookline Open Studios will be held on Sat/Sunday, April 27/28, 2019. 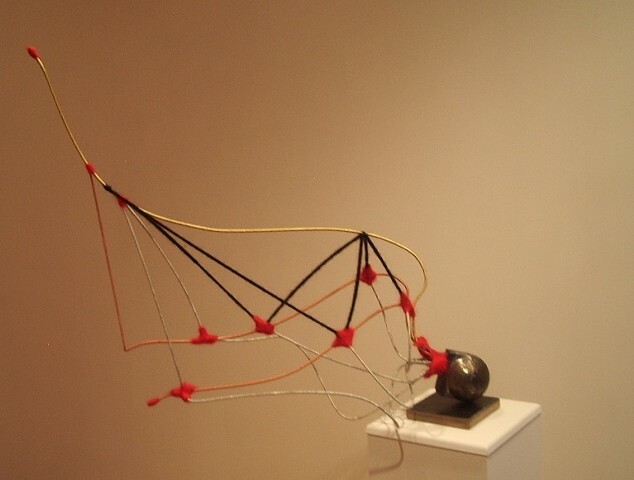 Studios Without Walls is a Brookline-based collaborative group of sculptors and conceptual artists who produce exhibitions of art in outdoor and public settings. We emphasize our community ties in both our exhibitions and programs of educational outreach. Our purpose is to expand and educate audiences to appreciate, participate in, and become enriched by site-responsive sculpture, installation, and conceptual art. We have been producing exhibitions together – originally at Allandale Farm in conjunction with Brookline Artists Open Studios – and consistently adding additional exhibitions and venues. All members all share in the annual determination of priorities and planning of the exhibits and receive feedback and stimulation from one another throughout the year. We seek to project a full and lively presence, increasing public visibility of creative thinking at work. We emphasize creative dialogue with the community-at-large, continuing to investigate opportunities for public art and elevating public discourse on the arts. I am pleased to have been included in this book. Nearly 500 photos of artwork with personal insights from 76 of today's most noteworthy artists show the tremendously broad range of possibilities that working in three dimensions can offer. In conjunction with the other two books in this acclaimed series, it invites readers to re-examine fiber art through a multifaceted contemporary lens. Both established artists and emerging artists whose work is attracting notice are gathered here. 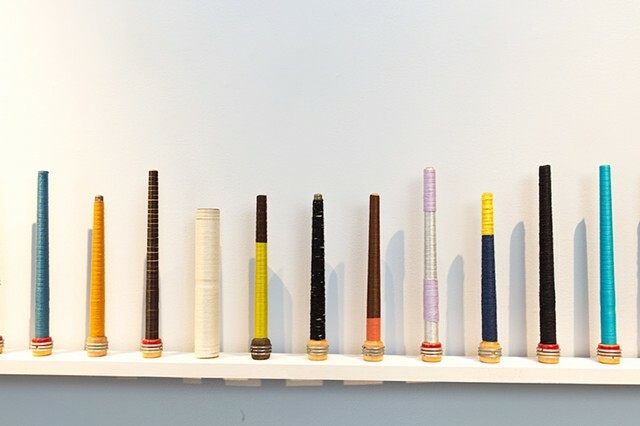 Carol Milne's knitted glass and Peter Gentenaar's technique of vacuum forming and air-drying paper fibers are but a few examples of artists using new materials with traditional methods. 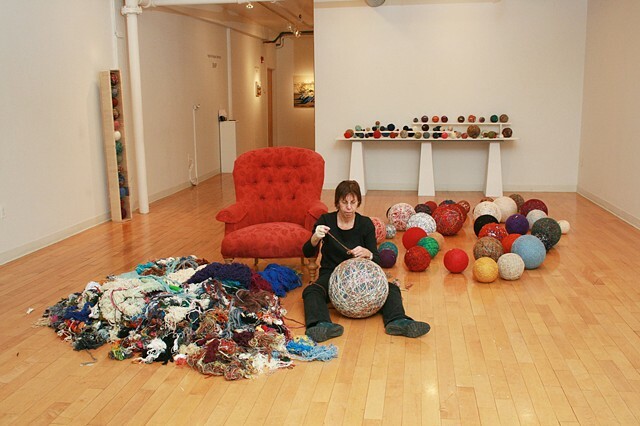 A life-long artist whose main medium is fiber, Janet Kawada shows her work internationally. Ms. Kawada taught at MassArt for over 20 years. Currently she is part of Studio Without Walls, a group of artists from Brookline who work in the environment. Ms. Kawada was a member of the Kingston Gallery for 14 years and its past director. 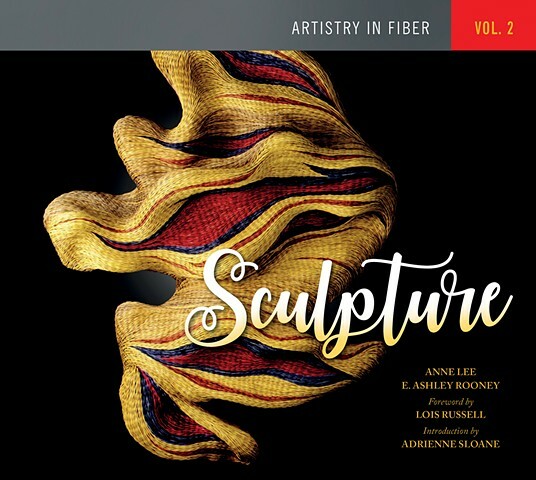 She is included in the book, Artistry in Fiber, Sculpture, Vol. 2. You can visit her website at www.janetkawada.com for more information. Migration has become a recurrent theme for our artist community in transition as we witness the migrations of people and other living creatures in this current social, environmental and political climate. As we watch thousands immigrate across continents and risk their lives, or entire species' patterns shift or decimate entirely, we turn to a tactile and historic tradition of meaningful utility. We contemplate 'migrations' within shifting and fluid ways of being and defining our own cultural, gendered and embodied identities. 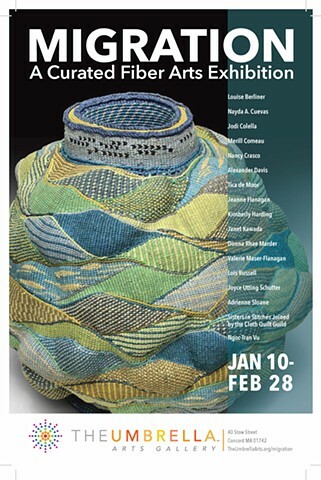 With the our physical gallery space in transition as the container, we have invited artists working with fiber arts from diverse contemporary and craft traditions, to engage with this theme and our community. Fiber is a rich tactile medium embedded with stories that reflect its connection to origin place and materials. The exhibit will pull together a collection of objects that store and carry, those that inscribe personal and family histories and traditions of place and new narratives on migration as journey. An evolving exhibition in its installation and opportunities for engagement are acts of moving from one place to another in and of themselves. We are excited to partner with Dignity in Asylum, a local non-profit with the mission to provide safe transitional housing and support for asylum seekers, refugees, people who have been granted asylum and unaccompanied minors at risk of homelessness on this exhibition. A portion of funds raised during this exhibition will be donated to support their work. My piece, Steel Wool "12, created in conjunction with Matthew Stone, is up for sale at the AIDS Auction. Opening Reception, September 27, 6-9 p.m. 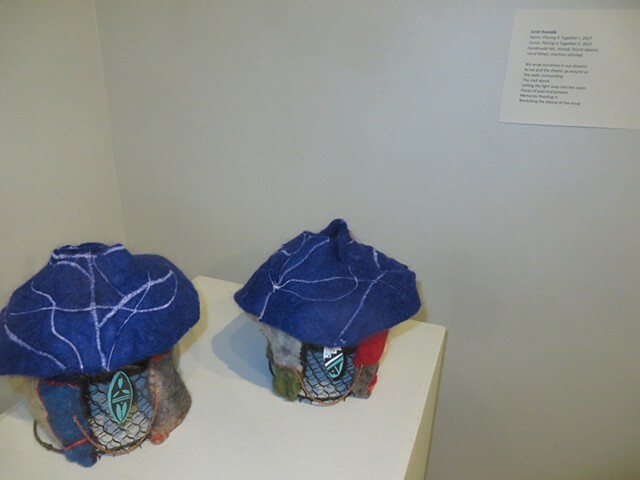 Using the word “Labor” as a point of departure, jurors Carole Frances Lung (Frau Fiber) and Amy DiPlacido selected fiber-based, or textile-inspired work by artists exploring the many possible definitions of the term and its relationship to art.